Judyth Vary was once a promising science student who dreamed of finding a cure for cancer; this expose is her account of how she strayed from a path of mainstream scholarship at the University of Florida to a life of espionage in New Orleans with Lee Harvey Oswald. 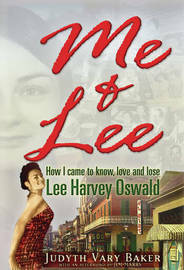 In her narrative she offers extensive documentation on how she came to be a cancer expert at such a young age, the personalities who urged her to relocate to New Orleans, and what lead to her involvement in the development of a biological weapon that Oswald was to smuggle into Cuba to eliminate Fidel Castro. Details on what she knew of Kennedy's impending assassination, her conversations with Oswald as late as two days before the killing, and her belief that Oswald was a deep-cover intelligence agent who was framed for an assassination he was actually trying to prevent, are also revealed. Edward T. Haslam is a former advertising music director and writer. He lives in Bradenton, Florida. Jim Marrs is an award-winning veteran Texas journalist whose books have reached the New York Times bestseller list. Crossfire has sold 1.5 million copies since 1990, and its theories were featured in Oliver Stone's movie JFK. His book The Alien Agenda (HarperPaperbacks:1997) is widely considered to be one of the most comprehensive and balanced journalistic accounts of the ET phenomenon. Marrs started out with the Fort Worth Star-Telegram and later owned several newspapers before becoming an independent writer.